"My mini urn arrived today 20th feb 2028 little smaller than I expected but that’s my fault never measured it properly but it’s lovely as I only wanted some off my dad’s ashes Mum has the rest"
This is the Oceane Quartz with Footprints Bio Cremation Urn, it is a large, or adult sized biodegradable funeral urn of the very highest quality. This beautiful, environmentally friendly urns for ashes has been hand finished to the most exquisite standard, and is made entirely of natural materials. 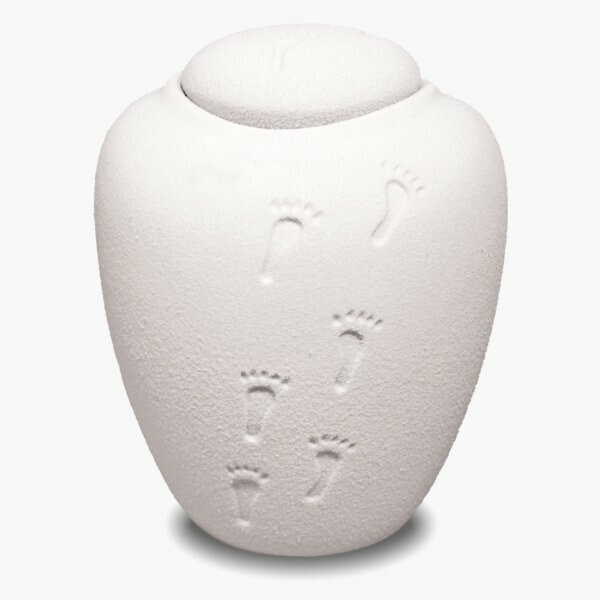 This is the Oceane Quartz with Footprints Bio Cremation Urn, it is a large, or adult sized biodegradable funeral urn of the very highest quality. This beautiful, environmentally friendly urns for ashes has been hand finished to the most exquisite standard, and is made entirely of natural materials. This urn will start to biodegrade the moment it is subjected to moisture, either in the ground or in water. The time this process takes will vary, because it is entirely dependent on the environmental conditions. Our eco-friendly funeral urns are exquisite products that help to preserve the environment and protect the future of our planet, a natural alternative, in harmony with nature that really is a beautiful and fitting testimony to the memory of a loved one. FILLING - The urn is filled through the top and sealed by moistening the rim of the lid, it will then self-seal. The urns have a hole in the bottom to allow water in so they are able to sink, so the ashes must be placed in the biodegradable bag. DIMENSIONS - Approx: 23cm high and 18cm wide / 9 inches high and 7 inches wide. CAPACITY - Approx: 3.3 litres or 200 cubic inches suitable for the ashes of an adult of approx. 91kg or 14½ Stone.